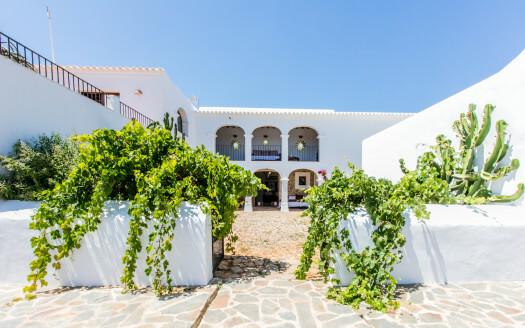 Can Baboo is an amazing hill top luxury villa in Ibiza for rent. Your perfect retreat with sea and country views for your next holidays in Ibiza. Small bedroom with large bathroom with queen size bed (180×200 cm) or configurated with 2 single beds for children. Luxury Guest Suite with spacious en-suite bathroom with large bathtub and shower. Samsung TV, Golden King size bed, built-in-closets, Sonos music system. Option to add 2 children beds. Luxury Guest Suite at the donkey park overlooking the gardens and the pool with huge en suite bathroom with large bathtub and showe. TV, King size bed, etc. Beach style villa with en-suite bathroom, open kitchen, wooden secluded terrace. King size bed, Sonos music system, dining table for 4. Open terrace with lounge beds and coffee table. 6 carport abd 4 car garage. Great location with unobstructed sea views and Morna valley. Only few minutes from Santa Eulalia, San Lorenzo, San Carlos and San Juan. 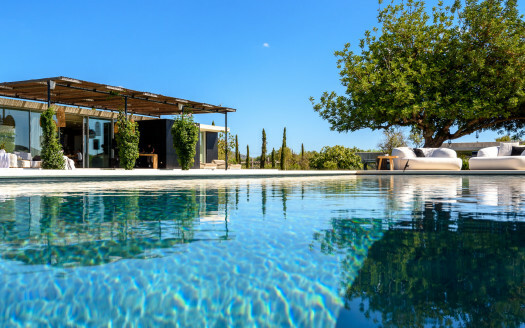 25 minutes from the airport and 20 minutes from Ibiza town by car.